Bangladesh erupted in protests after some refugees fled from the troubled Rakhine state of Myanmar to the country due to clashes between security forces and an insurgent group, an official said on Wednesday. According to a senior foreign ministry official of Bangladesh, the new refugees are from Rakhine Buddhist and various tribal groups, reports TOI. Bangladesh’s foreign ministry summoned Myanmar’s ambassador recently to protest over the new arrivals from Rakhine. Bangladesh is already struggling to manage the 740,000 Rohingya Muslims who had arrived in the country on August 2017. Apart from these refugees, there are also 300,000 refugees living in Bangladesh who had fled from Rakhine earlier due to violence. The foreign ministry official said that the number of refugees entering Bangladesh is increasing with some of them waiting near the border to enter the country. The new refugees had crossed in a remote hill area of Bandarban district in the southeast of the country. Now Rakhine’s ethnic majority, who are Buddhists, are in conflict with the army who helped drive out the Rohingya just 18 months ago. 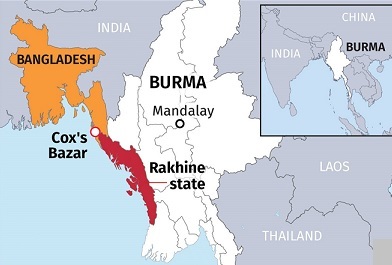 The Arakan Army, a militant group calling for greater autonomy of Rakhine had killed 13 people in raids on police border outposts on January 4. However, the accurate death toll is yet to be ascertained. Due to religious and communal violence, there has been much trouble in Rakhine which has led many of the residents of the place to flee from there.